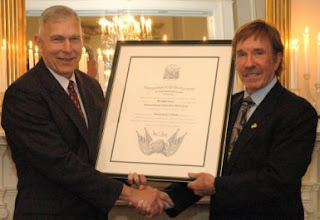 Last week, US Marine Corps Commandant Gen. James Conway made legendary martial-arts ninja and action movie star Chuck Norris an “Honorary Marine” at the commandant’s residence in Washington, D.C.
"I suspect the Corps gave the Marine title to Chuck out of fear..." said Lt.Col. "Whopper" Creedon, an officer whom also has had many exaggerated facts written about him. "... fear of getting a roundhouse kick in the face." Thank you Chuck Norris Sir! The guys too slow and too old. He's an old fart. What crap - Marines are estactic. This is a gimmick - when we least need gimmicks. There are thousands of Marines and families serving - why not take the time out and recognize them.